Agreed. You could always fav a page but why the need? They are so far behind, its crazy lol. Can anyone tell me what exactly is connection manager? Is it an app on my android phone? Yes, the app allows for seamless connection to the phones flux capacitor. Its in reference to Tmo’s portable hotspots tjey sell. Nothing to do with your phone bro… Or your flux capacitor..lmao! You may be a little young to understand that! 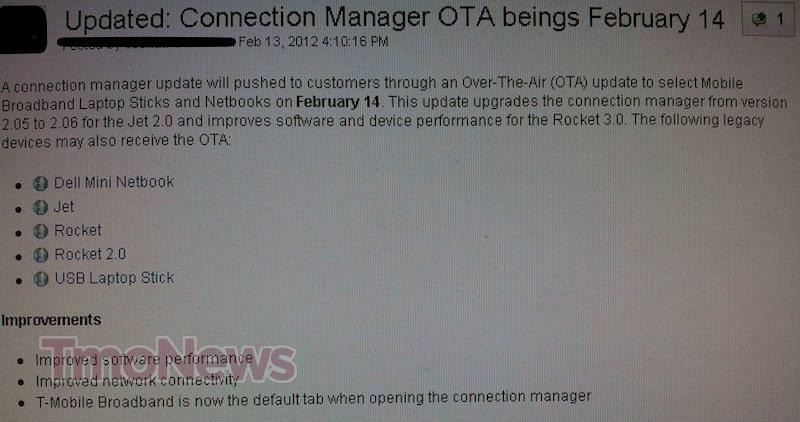 There is also a Rocket 3.0 Firmware update. I applied the firmware update and have not noticed any remarkable performance differences. The update for the Connection Manager can also be downloaded from the TMobile site, where the firmware is located. Connection Manager is TMobile’s webConnect software package that installs on Win XP, Vista and Windows 7 and acts as a network agent for its data broadband session with the Rocket and Jet USB devices. It’s not like using BlackBerry Desktop Manager for “tethering”.